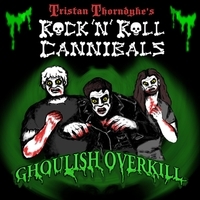 50's inspired rock and roll mixed with late 70's punk influences, and lyrically themed around horror movies. Think Chuck Berry meets The Ramones. Rock'N'Roll Cannibals would like to thank everyone who has supported us and our music throughout the years. This album is dedicated to Alicia Holston. Thanks for getting Tristan back to Texas. All songs written by Tristan D. Gragert except Mount Olympus. Mount Olympus written by Sarah Jax & G String Orchestra. Rearranged by Tristan D. Gragert. Produced by Tristan Thorndyke, James Carr, Cal Glabman & Kimberly Anne Cooper.